Job search for executives — and the c-suite and senior level, in particular — doesn’t look or work quite the way it used to. The digital age has made a huge impact. But modern job search strategies are not always the ones that work the best. Whether you’re getting ready for a career move or stuck in a protracted, daunting job search, getting on the right track is critical. Want to know what executives who land faster these days know and do? 1. Writing or updating your executive resume is NOT step one. 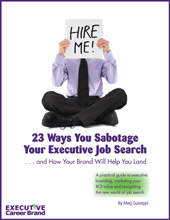 The biggest mistake executive job seekers make is writing their resume with no clear career targeting. That is, not determining at the start of their job search which companies offer them a good mutual fit. Recruiters and hiring decision makers assessing you through your resume (or LinkedIn profile and other career marketing materials) don’t have time to sift through irrelevant information. They need to quickly and clearly see your ROI and good-fit qualities for them. 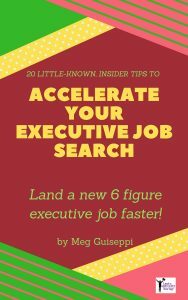 Step one in executive job search is targeting several companies and researching what you can do for them right now to meet their needs. 2. 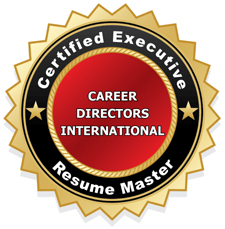 Relying entirely on executive recruiters limits your possibilities. Yes, you should source and work with several recruiters in your niche, and position yourself online to be found by them when they’re sourcing candidates. They may be recruiting for your target companies or know about opportunities that will be a good fit for you. But remember that recruiters work for the client companies that pay them, not job seekers. They don’t match opportunities to your qualifications. They match job seekers to job opportunities. Don’t wait for recruiters to reach out to you. 3. Personal branding helps you land. By digging deep and defining your unique combination of key personal attributes, passions, strengths, talents and values, personal branding helps you communicate your good fit BEYOND your target employers’ requisite qualifications. These days employers have their pick of the cream of the crop. So many others like you are likely to fit their requirements down the line. Communicating only how you offer the same, full range of expertise as everyone else doesn’t distinguish you and give you an advantage. Branding also helps you communicate your good-fit qualities for your target companies, when you network and interview. 4. 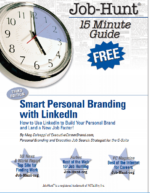 LinkedIn, social networking, social media and online presence are no longer optional. To be part of today’s global marketplace, you need to be at least somewhat active with social media. Being social media savvy can be a qualifying skill set, especially if you’re trying to overcome age bias. Social recruiting is the now the norm. 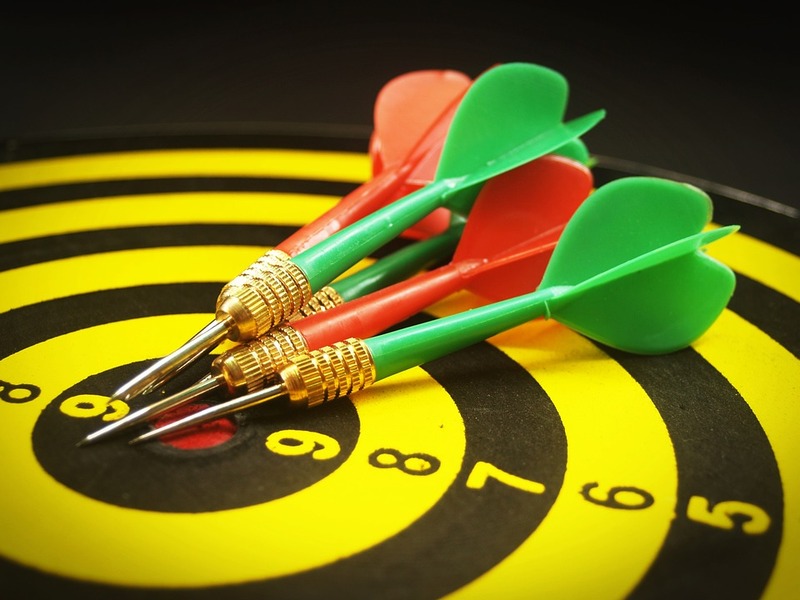 Recruiters and hiring decision makers at your target companies use social media to connect with their network and source candidates. They’re hanging out on sites like LinkedIn (most especially), Twitter and Facebook. If you’re not there, you may not connect with them. And your activity on social media provides them social proof that you are who you say you are. You are being Googled by people assessing your fit as a candidate. If there are little to no search results when “your name” is searched, you may be passed over in favor of those with a stronger online footprint. Job search success means showing up . . . on Google. You need to be visible online to be found. Work on creating a realistic social media routine, that includes regularly self-Googling, to monitor the search results the world is finding for “your name”. 5. Job boards are mostly a waste of time. Networking gets the job. Trolling the job boards, and posting your resume to as many as possible is not a very successful job search tactic. It’s estimated that only 5-10% of job seekers − especially those at the senior and top executive level − land jobs through the job boards. Networking is one evergreen job search strategy that still gets the job better than anything else. Something like 80-90% of executive jobs come through networking. 6. Treat your job search like you’re running a company of one. Whether or not you actually set up a consulting business to hire yourself out — which may be a great option for you — your job search is a full time sales and marketing job for BRAND YOU. You need to create a solid game plan to promote your business (that is, BRAND YOU) in the digital age, and hold yourself accountable to carry out daily goals. 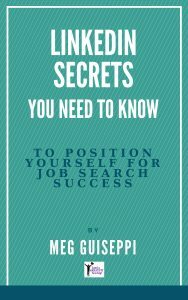 Part of your job, in finding a job, is to learn about the new job search itself, so you’re prepared to understand all that needs to be done. 7. Avoid employment gaps by volunteering. Executive job search at the c-suite and senior level can take a long time. Close gaps in your LinkedIn profile and resume by showing that you’ve been actively engaged in relevant work. Work is work . . . whether or not you’re paid for it. Make it a career-long habit to stay involved with your favorite non-profits and charities, providing support in your areas of expertise. Everyone wins!